Trail cars and debris lay scattered along the hillside south of Minturn following a 1915 accident. 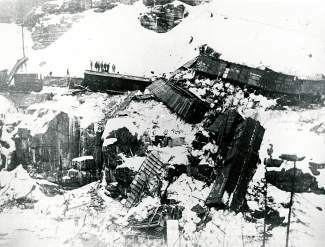 The crash killed Engineer Fred Graham and involved 44 cars. Officials from the Colorado Department of Transportation joined CDOT Eagle Resident Engineer Martha Miller and Eagle Town Engineer Tom Gosiorowski for the official ribbon cutting for the Eby Creek roundabouts project. In a unanimous vote following an executive session, members of the Eagle Town Board reversed an earlier decision and said they would not reimburse Mayor Yuri Kostick and town board member Doug Seabury for costs associated with their private trip to Florida to meet with Haymeadow developer Alan Cohen. The board learned that paying for the trip would violate Colorado ethics law. Thanks to a grant from the Colorado Energy Office’s Surge Ahead Colorado Program, Eagle County installed a vehicle charging station on the west side of its circle drive in Eagle. The town of Eagle and Eagle County launched talks with the president and CEO of Augustana Care Corp. regarding a partnership plan to build a senior care facility in town. The Eagle Valley Chamber of Commerce planned a December mixer at the Eagle Regional Visitor Information Center to celebrate the facility’s impact. The info center welcomed more than 32,000 people during 2010. Eagle Valley High School Devils Dancer Haley Monica was selected for the all-state spirit squad. The Eagle Valley Chamber of Commerce named CenturyTel as its Business of the Year. Edwards resident Don Cohen nominated the telecommunications company for the honor. Downtown Eagle merchants announced Noel Night — a special holiday shopping event on Broadway. Summit County politician Gary Linstrom announced he would seek the Democratic nomination for Colorado governor. While federal lawmakers increased the national speed limit, Colorado drivers were warned they needed to keep it at 55 mph until posted limits across the state changed. Eagle County Buildings and Ground staff had a bit of fun with their holiday decorations by perching a Santa figure on the stone eagle on the east side of the county building. The result looked like Santa has ditched the sleigh for a new ride. Although it sounded like a turn of the century incident, Eagle Police responded to a horse and buggy accident on Broadway. The buggy was traveling westbound on Third Street when the horse spooked and started running out of control on the wrong side of the road. At the same time a car was traveling eastbound on Third and the driver had to swerve and run over a curb and sidewalk to avoid the buggy. No tickets were issued. Noting that he only attended 70 percent of the meetings, the Eagle Valley Enterprise editorialized that Eagle Town Board member Paul Hayes should step down from office. “Hayes can be effective when he take the time and makes the effort. Unfortunately, he is not present at enough meetings,” the paper stated. The Eagle Lions Club was preparing to continue a 36-year tradition with the arrival of Santa at the Eagle County Airport. Local kids were invited to take part in the event, which began back in 1954. Eagle County School District appointed members to a special committee to study the installation of seat belts on school buses. A 43-year-old Sweetwater man, Theodore “Ted” Rants, died when his tractor overturned. He was moving dirt from a pile to fill a hole next to it when the accident occurred. Vail Associates Inc., announced record ticket sales during the Thanksgiving holiday. More than 21,000 skiers came out to enjoy the early season conditions. The EVHS cheerleaders won the trophy — by a landslide — as the outstanding cheer squad from the Middle Park Wrestling Tournament. The squad included Lisa Warder, Vonnette Havener, Greta Bobson and Nancy Gates. Skelly’s Mountain Side Inn in Edwards offered a Saturday evening special — a filet mignon dinner by candlelight with soft music. The price was $3.95. The Colorado State Department of Health announced it would supply polio vaccine to public health nurses in areas of the state that did not have organized health departments. The Eagle County Public Nurse’s office in Eagle and Minturn planned to host vaccination clinics every two months. Mary Thomas of Eagle was selected to serve as the Eagle County chair of the 1965 Christmas Seals campaign. The effort raised money for the Colorado Tuberculosis Association. Santa was due to arrive at the Eagle County Airport on Dec. 18. His schedule included handing out gifts and candy in the morning and treating local children to a movie in Eagle in the afternoon. Both the junior high and high school Eagle basketball teams bested the McCoy Wildcats. The younger boys triumphed by a score of 34-11 and the varsity team won a tight 41-40 contest. The Eagle Pharmacy advertised “Gifts galore and wonderful new toys.” The Pharmacy offered both layaway and gift wrapping services. The Eagle County commissioners approved a $1,350 land purchase for property on the Hemberger-Spangler Ranch on Cooley Mesa with the intention of building an airstrip at the site. George Carlow, who had been serving with the Navy and posted in California, was set to receive his discharge and he expected to be back in Eagle before Christmas. Organizers of the Eagle High School Carnival reported the event raised $116.15. After expenses totalling $42, the students realized a profit of $73.87. The money was earmarked to pay expenses incurred by the athletic association and purchase gym equipment for both girls and boys. Students from Eagle County High School presented two one-act plays, “Elmer,” and “His First Girl.” Admission was 15 cents. The E.E. Glenn and Company Store advertised six cans of peas for 83 cents, six cans of corn for 81 cents and six cans of string beans for 78 cents. Solitaire coffee cost 30 cents per pound.